Providing you the best range of mobile operated pumps with effective & timely delivery. Aimed at prosper growth in this field, we are engaged in manufacturing and supplying optimum quality Mobile Operated Pumps. 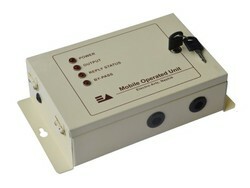 This pump can be made ON or OFF from any distance by sending a SMS to Mobile Operated Unit (MOU) which is interlocked with the starter of the Pump. Offered pump is accessible in numerous specifications so as to meet the demands of customers. Besides, this pump is stringently tested on various quality parameters to ensure its defect free range.